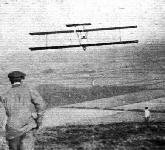 The Farman "Goliath" upon which Bossoutrot made his record flight, as recorded last week in "Flight." 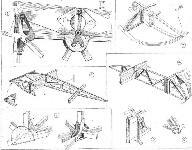 Note the pair of Leitner-Watts 3-bladed metal air-screws which helped the French machine to victory. Moreover, these nine-foot propellers are entirely British, being designed by Mr. Watts, and manufactured for the Metal Air-Screw Co., Ltd., at Messrs. Rubery Owen's well-known works. THE ALBATROS, TYPE L.57 MONOPLANE, ROLLS-ROYCE "FALCON" ENGINE: Three-quarter front view. THE ALBATROS L.57: Note how fuselage deck fairing is carried into the curve of the wing. THE PULITZER TROPHY RACE: The Navy-Curtiss Racer entered by the U.S. Navy. This machine has radiators embodied in the wings (the previous Navy-Curtiss Racer having Lamblin radiators), 400 h.p, Curtiss CD 12 engine. THE PULITZER TROPHY RACE :- One of the two Army-Curtiss Racers entered by the U.S. Army Air Service. These machines have wing radiators, and are fitted with 375 h.p. Curtiss D 12 engines. One of these machines, piloted by Lieut. R. L. Maugham, won the trophy at a speed of 206 m.p.h. THE COUPE DEUTSCH: The Nieuport-Delage biplane on which Lasne (inset) won this year's race. THE COUPE DEUTSCH: The Italian representative. 1, Mechanics struggling with the high-compression Flat engine 2, Brack-Papa landing after the race. 3, Signor Brack-Papa, the famous Italian pilot of the Fiat. 4, The 700 h.p. 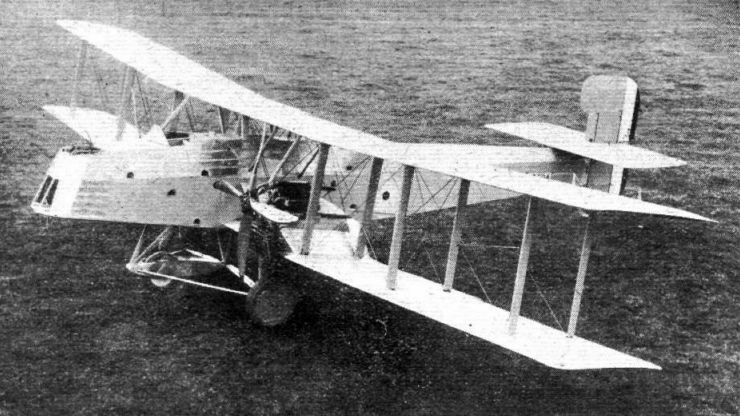 Fiat biplane. THE COUPE DEUTSCH: 1, The British representative, Mr. J. H. James. 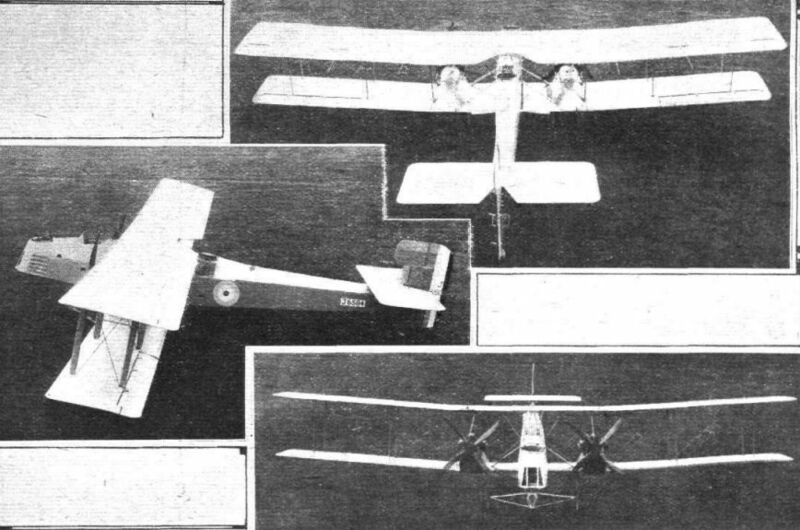 2, The Gloucestershire Aircraft Co.'s Mars I, 450 h.p. Napier "Lion" engine. 3, James landing after his struggle with maps. THE PULITZER TROPHY RACE: One of the three monoplanes entered by the U.S. Army Air Service. The Loening cantilever, 600 h.p. Packard. THE COUPE DEUTSCH: 1, The Nieuport-Delage in the air. 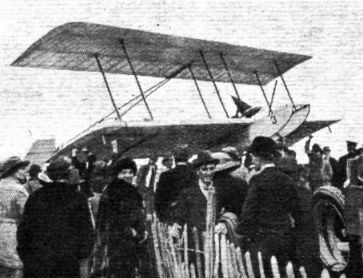 2, The "Sesquiplan" flown by Lecointe. A very pretty little machine, similar to last year's, but with a different wing section. 3, Lecointe landing. A few seconds after this photograph was taken the machine turned over, fortunately without injuring the pilot. 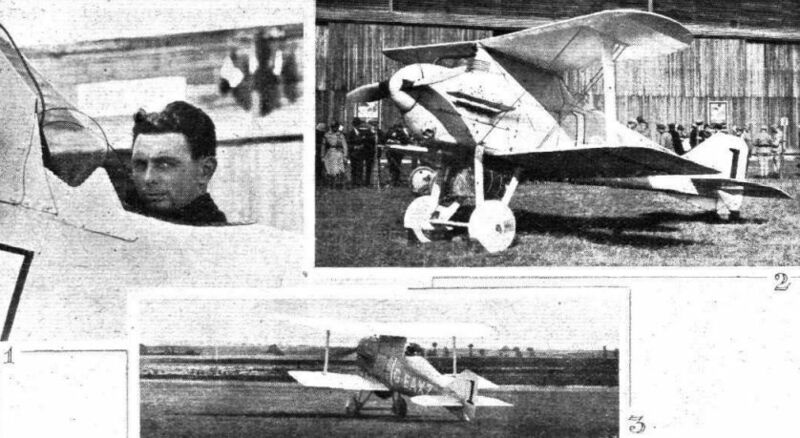 4, M. Sadi Lecointe, the famous Nieuport pilot, who had a marvellous escape when his machine turned over on landing. 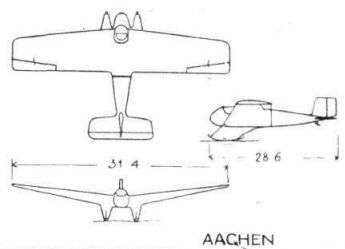 MR. JEYES' AACHEN MONOPLANE: Inset, the machine in flight. BRINGING HER BACK: Our photograph shows one way of bringing back a glider to the top of the hill after a flight. 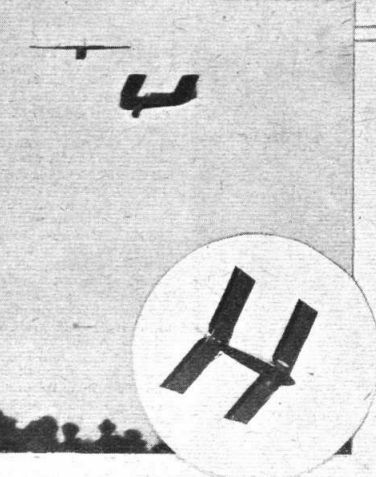 The wings are stacked on a German hay cart, the fuselage being trailed behind. 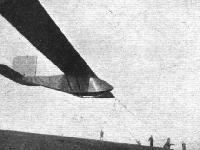 The machine shown is the Aachen "Tail-first" monoplane on which Herr Klemperer crashed after getting into a spin when his glider was dropped from a kite balloon. THE COUPE DEUTSCH: The Spad representative. 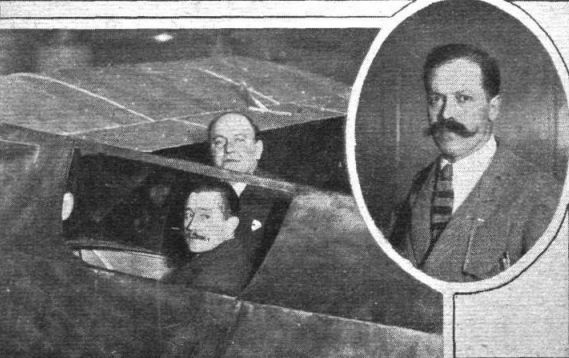 1, M. Andre Herbemont, the famous Spad designer, and M. Jean Casale, pilot of the Spad. 2, the Bleriot-Casale biplane. 3, Casale alighting with engine trouble. A DEUTSCH CUP "TAIL-PIECE": What all the pilots had to endure at Etampes. M. Casale as the smiling victim. 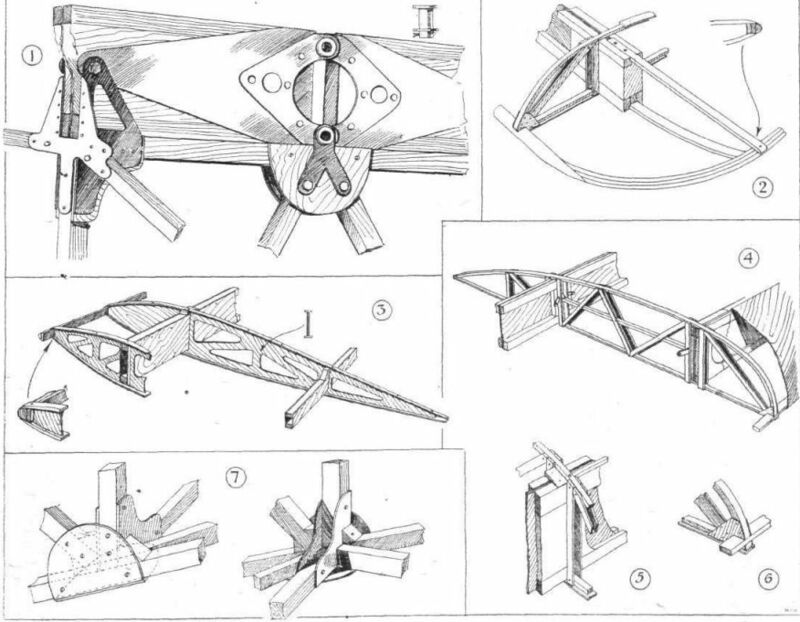 The Espenlaub monoplane, constructed by a carpenter out of all sorts of odds and ends. In spite of its very rough construction the machine flies very well. 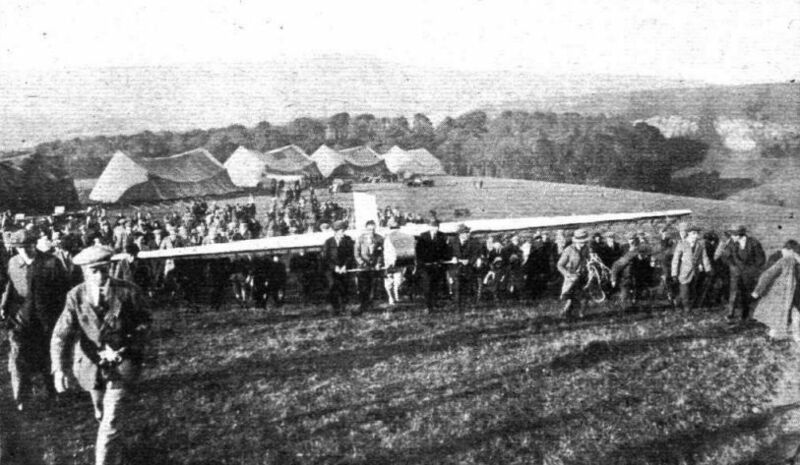 Lifting the Fokker Glider over the heads of the crowd before the start of the flight. Fokker steadying the tail of his glider as it is being lifted out of the hangar. 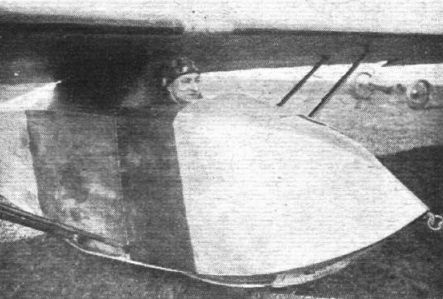 On the right the famous Dutch pilot-designer is seen in the seat of his glider. 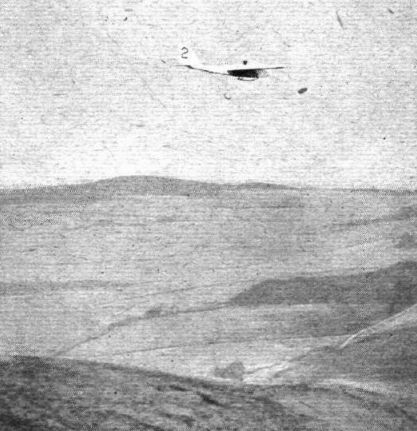 FOKKER'S FIRST FLIGHT IN ENGLAND: The upper photograph shows the first start, which was unsuccessful. For the next start the machine was towed by a motor-car, and the machine got into the air as shown in the lower picture. 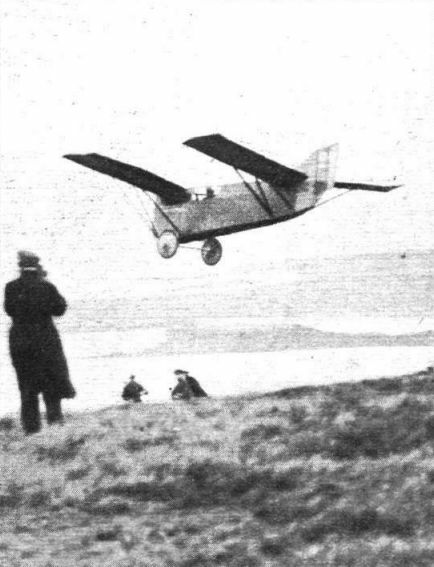 Fokker starts off on his 37 minutes' flight. THE FOKKER MACHINES: On the left, the small single-seater biplane, with pilot's seat on lower wing. 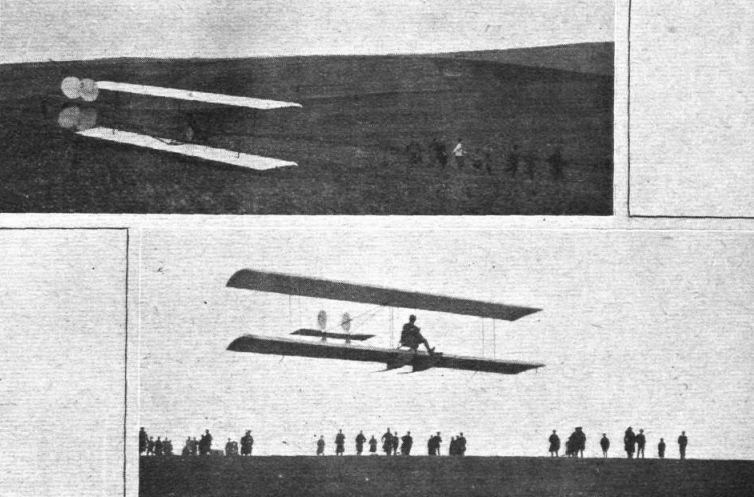 On the right, the two-seater, which has an enclosed nacelle, is seen in the air, piloted by Mr. Olley. 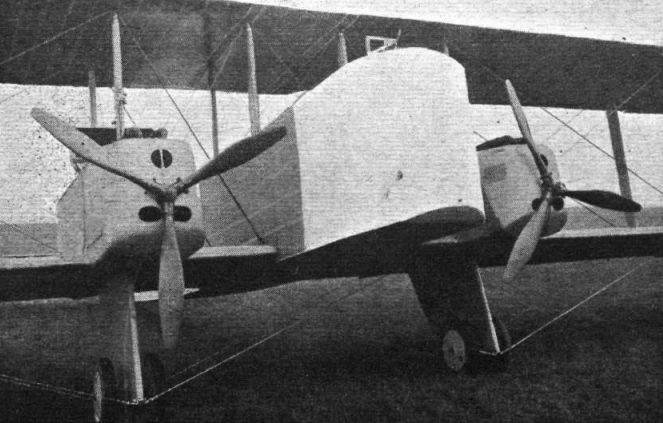 Note the central skid and wing-tip guards. 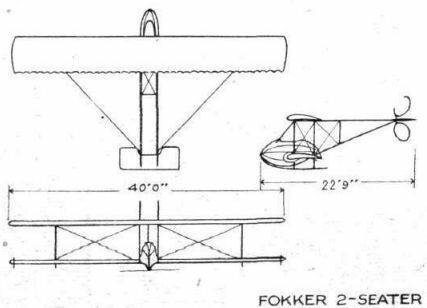 Fokker's method of transport: The biplane glider is placed on a plank resting on the sides of the car, and the machine is lightly braced fore and aft by two ropes. 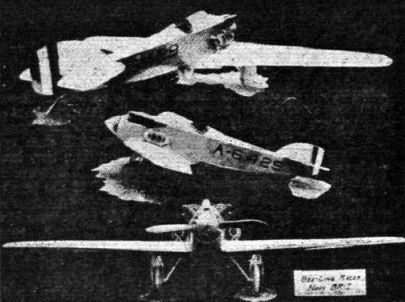 THE PULITZER TROPHY RACE: The Navy BR-2 ("Bee-Line") monoplane, 380 h.p. Wright. 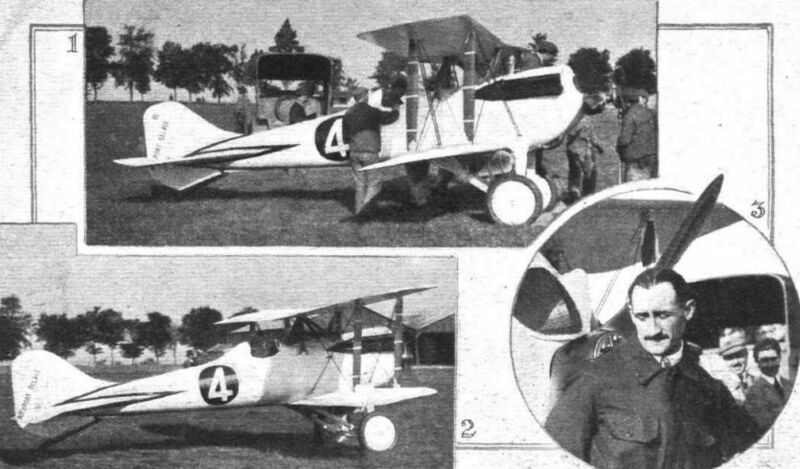 THE PULITZER TROPHY RACE: One of the three monoplanes entered by the U.S. Army Air Service. The Thomas-Morse TM 22 all-metal "parasol," 600 h.p. Packard. 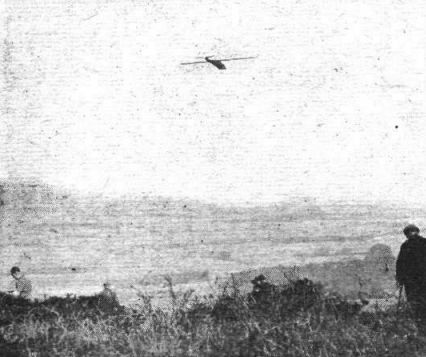 THE PULITZER TROPHY RACE: One of the three monoplanes entered by the U.S. Army Air Service. 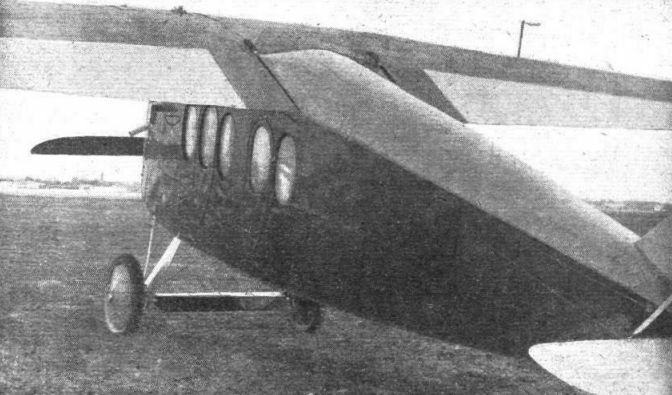 The Verville-Sperry cantilever, 380 h.p. H3 Wright (racing model). 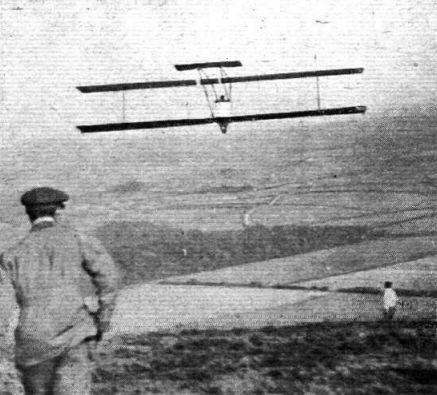 Raynham's Glider pegged down on the summit of Itford Hill. Carrying Raynham's Glider up to the top of Itford Hill. In the background may be seen the five tent hangars used for housing the machines. WILLING HELPERS: A detachment of the R.A.F. carrying Gordon England's and Raynham's gliders to the top of the hill. Raynham starting off on his 11 1/2 minutes' flight. 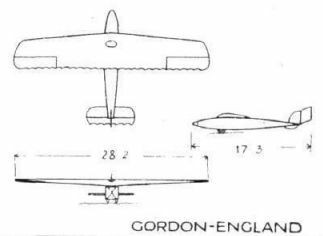 In spite of its "unlucky" number, Gordon England's monoplane gets up well, and is remarkable for its extremely steady flight. 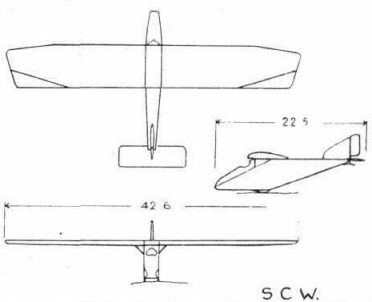 Sketch of the S.C.W. 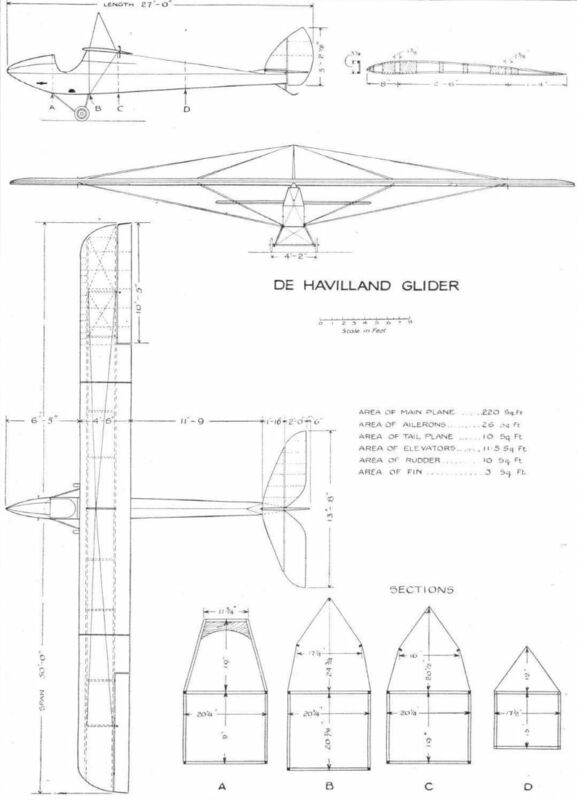 (Sayers) Glider in flight. THE "S.C.W." 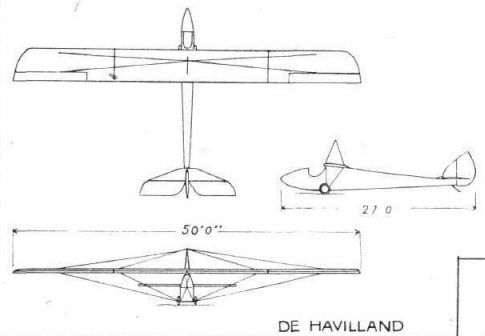 MONOPLANE GLIDER. Some constructional details. 1. 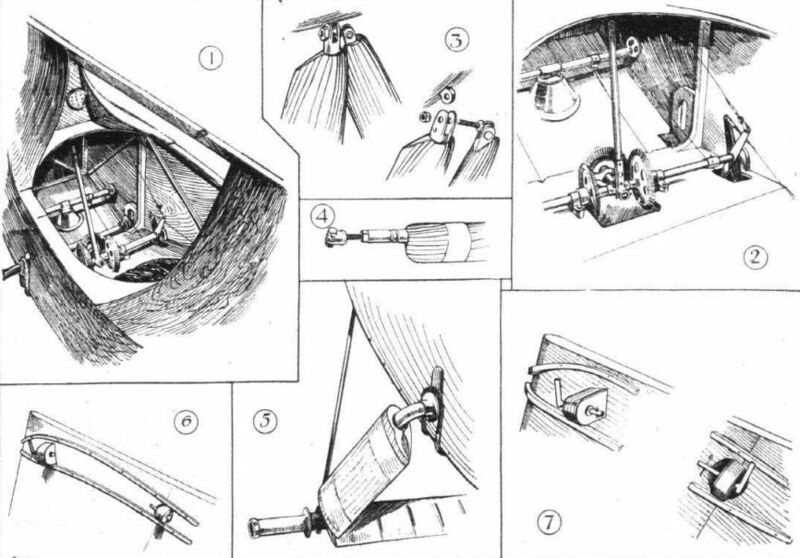 Metal fittings securing spar to top longeron, and also spar root fitting. 2. Construction of wing tip. 3. Details of elevator. 4. 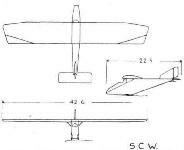 Sketch showing spar and rib construction. 5 and 6. Details of rib. 7. 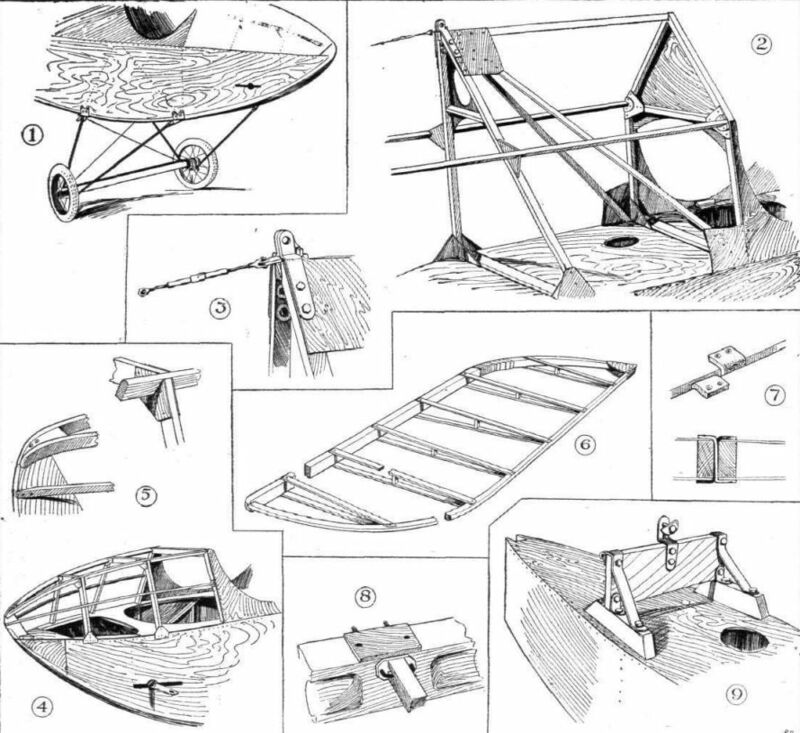 A typical fuselage joint, showing three-ply "fish-plates." 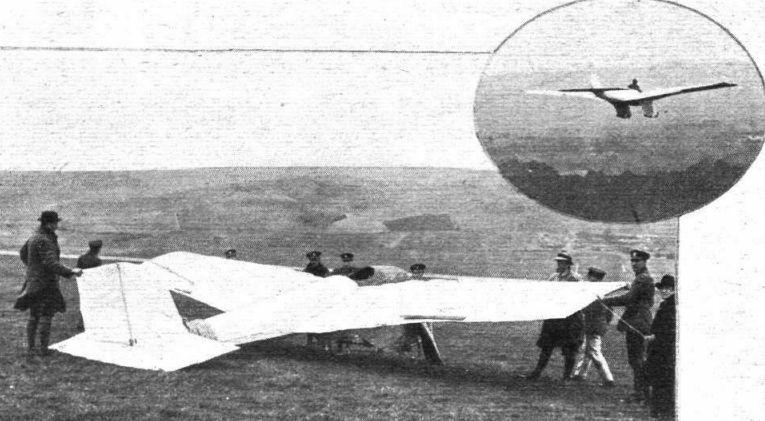 The Winner: Bringing the Peyret monoplane up to the top of Firle Beacon. 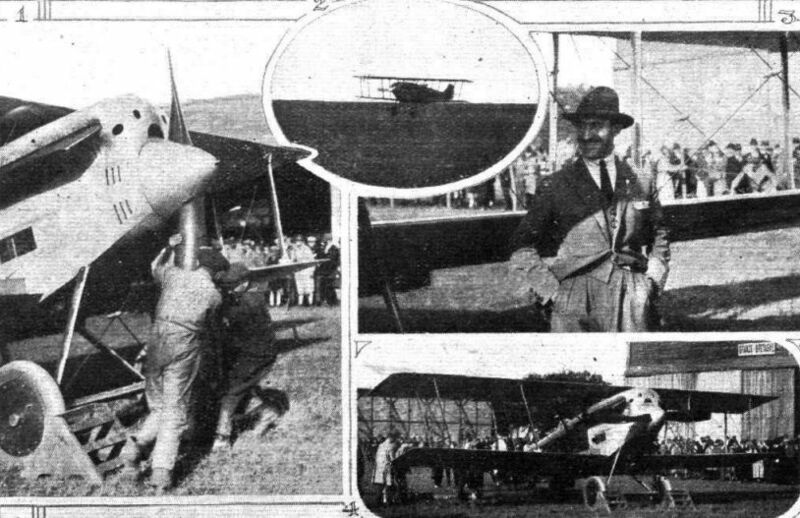 THE START OF A FAMOUS FLIGHT: M. Maneyrol's Peyret monoplane gets away on October 21 for its record flight. 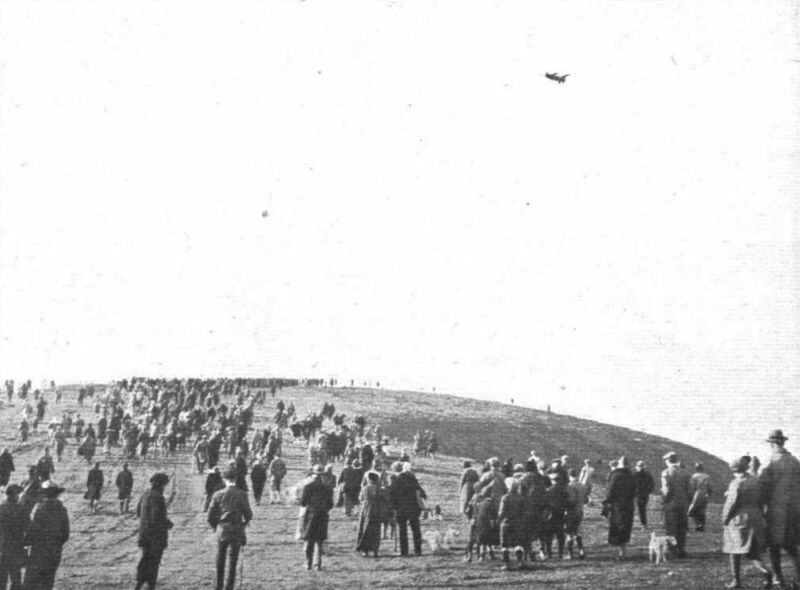 SOARING AT FIRLE BEACON HILL: General view, showing a small section of the crowds who watched; M. Maneyrol's splendid performance. Note the altitude above starting point. NEAR THE FINISH: Our photograph shows the Peyret monoplane and Sqdn.-Ldr. 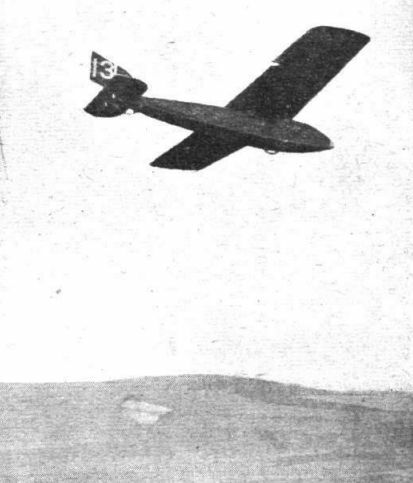 Gray's "Brokker" in the air together. Inset, another view of the Peyret. As the machines approached one another the two pilots would wave a cheery greeting and then drift apart once more. In spite of the darkness the machines did not appear to be in any danger of colliding. The Winner: M. Maneyrol, in the cockpit of his machine, photographed at Selfridges, where the Peyret monoplane is on view this week. Behind the machine may be seen Lieut.-Commander Larrouy, manager and interpreter to M. Maneyrol. 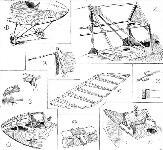 Inset, M. Louis Peyret, who designed and built the winning machine. 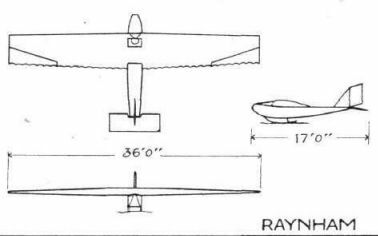 THE PEYRET MONOPLANE: Diagrammatic representation of the control system, by which the wing flaps are used as combined ailerons and elevators. 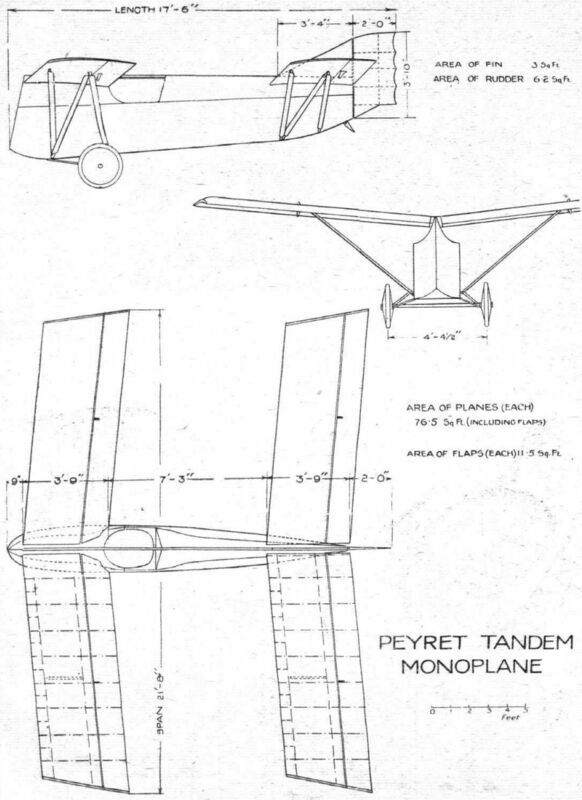 THE PEYRET MONOPLANE: Some constructional details. 1, View into the cockpit, showing controls and position of air speed indicator. 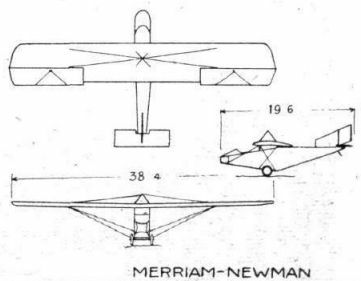 2, The differential control by which the flaps are operated as combined ailerons and elevators 3 and 4, Details of the wing bracing strut attachments. 5, One side of the undercarriage. The wheel has been omitted for the sake of clearness. 6, Front wing roots on fuselage. 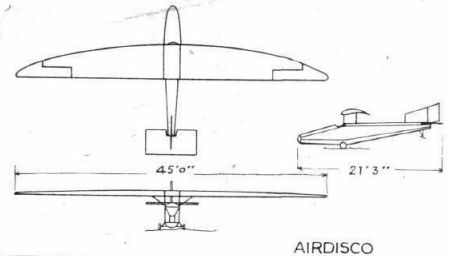 7, Details of spar attachment to fuselage. Note metal-faced ply-wood wing roots, and quick-release bolts. A late-comer with a fine performance: Three-quarter front view of Sqdn.-Ldr. 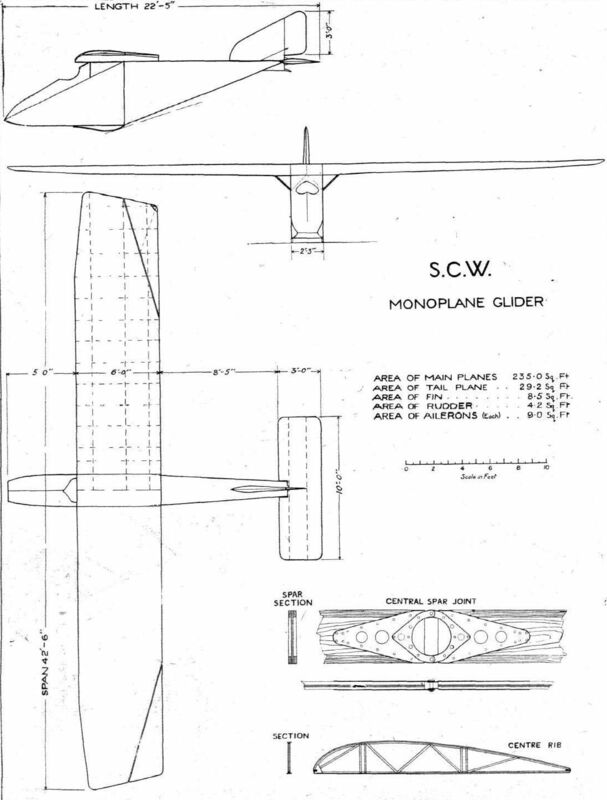 Gray's monoplane. This machine was made from the fuselage of a Bristol Fighter and the top plane of a Fokker D.VII, and was consequently nicknamed the "Brokker." 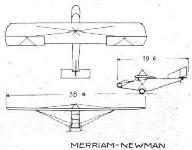 The Merriam-Newman monoplane photographed just before the start of the flight which ended in a crash. THE "AIRDISCO" MONOPLANE: On left, machine is seen taking off for a flight, piloted by Rex Stocken. 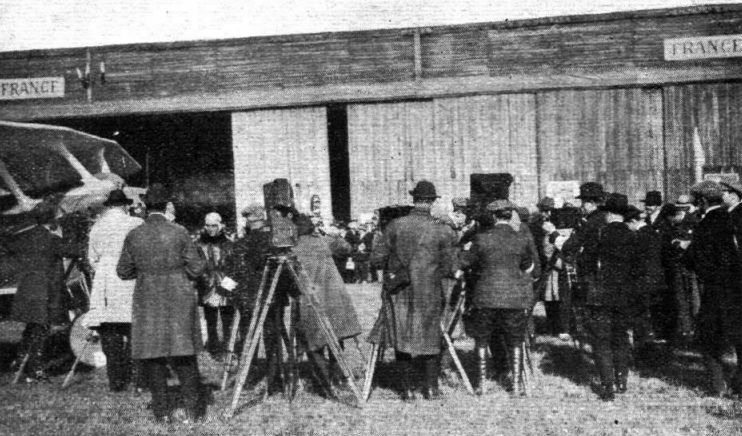 On the right, a three-quarter rear view of the machine. Note the crescent-shaped wing.